Maybe you didn’t know, but I’ve been living a double life for some time now. Yep. 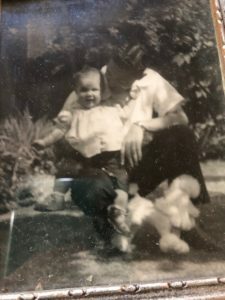 At home, I’m Kathy Hogan Trocheck, mild-mannered junker, wife, mom, grandmother, recovering journalist (I was a reporter for The Atlanta Journal-Constitution for many years) and decorator in denial. 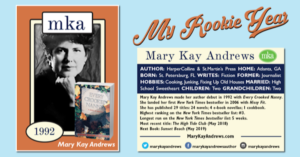 But in public, when I’m wearing makeup and not-yoga-pants, I’m Mary Kay Andrews, best-selling novelist and author of 28 novels and (and The Beach House Cookbook) and counting. Not dead at all, I can assure you. And now I’m dropping back onto my sometimes-neglected blog to share the news that my rookie book, Every Crooked Nanny, which is the first in the Callahan series, will be a Kindle Monthy Deal for only $1.99 from Oct.1-Nov. 5, 2018. Download yours now while this deal lasts! If you haven’t already met Callahan, her irascible mother Edna Mae and the rest of her House Mouse crew, I think you are in for a treat. Here’s a little of Callahan’s backstory. She’s a former Atlanta police detective, who quits the department due to sexist bosses who don’t think a woman can be a good homicide cop. 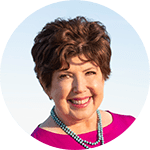 She gets a private investigator’s license, but when business isn’t as brisk as she’d hoped, in frustration buys a cleaning business called The House Mouse. Callahan and Edna share her home, a Craftsman bungalow in the real Atlanta intown neighborhood of Candler Park. Her House Mouse cleaning crew “girls” are an eccentric bunch, a loud-mouthed big-boned gal named Neva Jean who is married to good-old-boy Swannelle, elderly African-American sisters Baby and Sister, and the quietly religious Ruby. In Every Crooked Nanny, Callahan’s first outing, she’s hired by an uppity former sorority sister to track down the family’s missing nanny, who, before running off with the family secrets, has gotten a little too cozy with the man of the house. Because I wrote the eight Callahan mysteries before the advent of Google, Smart Phones or the GPS, my low-tech sleuth relies on good old-fashioned street smarts and shoe leather to solve the crimes that occur in and around Atlanta with unnerving regularity. I hope you’ll agree—and at $1.99 for the first installment, that you’ll want to binge-read all eight books in the Callahan Garrity series. Here’s the list, from first to last. Enjoy! It’s hard to believe that another summer is about to be officially behind us. As we begin our Labor Day weekend, I’m pleased that Mr. MKA and I do not have much planned. We will kick back and enjoy some much-needed downtime. I think we will take a relaxed approach to our meal planning too. 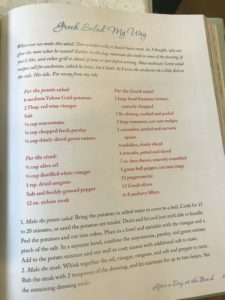 I’ve gathered a few of my simplest no-fuss recipes from THE BEACH HOUSE COOKBOOK to compile what feels to me like the best hassle-free Labor Day menu plan for Labor Day weekend. Enjoy the fresh, simple goodness of Greek Salad My Way. 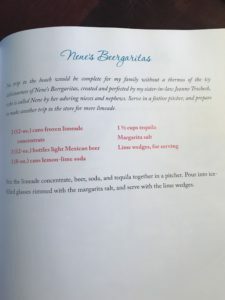 You can find the recipe on page 85 of THE BEACH HOUSE COOKBOOK. 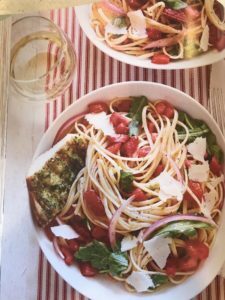 Fresh tomatoes are the star of this easy-peasy Fresh Tomato Pasta dish, which is perfect for this time of year when tomatoes are so ripe and delicious. Find this recipe in the “After a Day at the Beach” menu on page 81 of THE BEACH HOUSE COOKBOOK. What screams summer more than ice cream sandwiches? 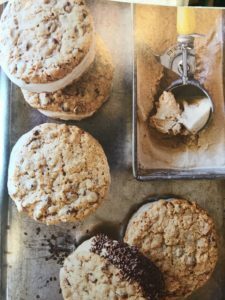 The Sweetie Pie Ice Cream Sandwiches are the perfect dessert to send-off Summer 2018 in style. Find them in the “Full Moon Party” menu on page 114 of THE BEACH HOUSE COOKBOOK. Enjoy your Labor Day Weekend, y’all! Cheers! The High Tide Club Cocktail! Happy #ThirstyThursday to you! 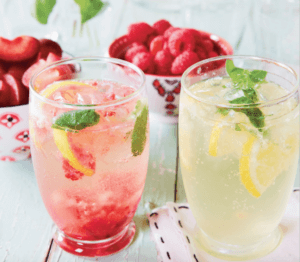 What are your favorite #summersippers? 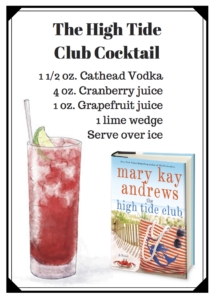 Thanks to their generous support for my book tour this summer for THE HIGH TIDE CLUB, I was introduced to Mississippi-based Cathead Vodka. And I’ve since been enjoying this refreshing concoction. Give it a try this summer whether you’re on vacation, at the beach, or just winding down at home on a hot summer night. #Cheers, y’all! You know what makes an awesome gift for that dad who has enough neckties, aftershave, golf doodads, and fishing tackle? A cookbook! 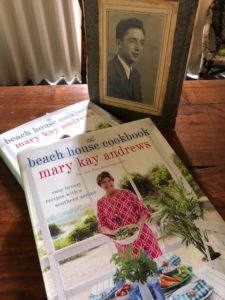 Might I suggest my very own, THE BEACH HOUSE COOKBOOK? My own dad, however, was never much of a cook. He came from that generation that expected to sit down to a hot homemade dinner every evening, but his own cooking expertise was limited to opening a can of tomato soup or heating up jarred tamales. 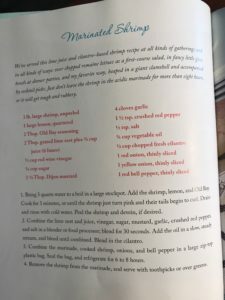 Which was okay with my mom, who was a sensational cook. Friends still speak wistfully about her chocolate pie, pot roast, mashed potatoes and gravy, fried chicken, and carrot cake. Since I’m finally home from the five-week-long book tour for THE HIGH TIDE CLUB, I’m already making plans for the weekend. This Father’s Day, our family, including son Andy (aka Boomerang Boy) daughter Katie and her husband Mark, along with Molly and Griffin, will gather at our house to celebrate. I think we’ll give Tom and Mark the day off from their usual grilling chores. They can sip some Boozy Arnold Palmer Cocktails or Beergaritas while dinner is prepared. What’s on the menu? 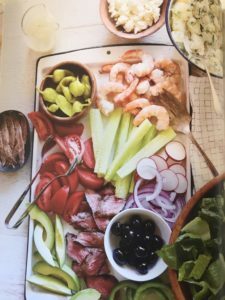 Thinking that with the swamp-like summer temperatures already enveloping us here in Atlanta we’ll do something like the make-ahead Marinated Shrimp which we can serve over salad for a complete meal. Our garden cucumbers are about to overrun the backyard, so I see the Marinated Cucumbers & Onions in our future too. 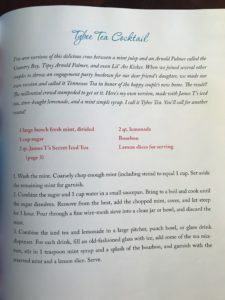 And since both the dads we’re celebrating have a sweet-tooth, Katie and I might have to whip up a dessert buffet, including the kid’s favorite Trailer Trash Dessert, along with a Peach and Berry Cobbler to take advantage of those sweet Georgia peaches just turning up at our local farmer’s market. The perfect Father’s Day menu! 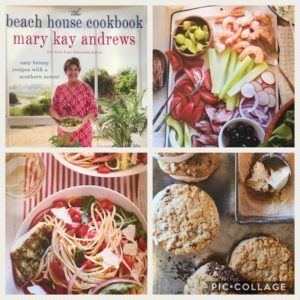 Get all the recipes in THE BEACH HOUSE COOKBOOK. And sometime during the day—probably right around the dessert course, which was always my Dad’s favorite, we’ll pause to toast and pay homage to all the good dads we’ve been fortunate enough to have known. Springer Mountain Farms & my Chicken Enchilada Dip! On Thursday 9/28/17 at 9pm EST, I’m coming at you via Facebook Live on the Springer Mountain Farms Facebook page. 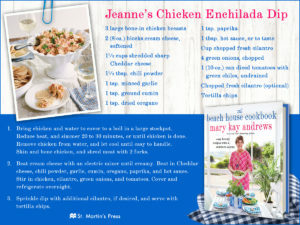 Tune in as I prep “Jeanne’s Chicken Enchilada Dip” recipe from The Beach House Cookbook. 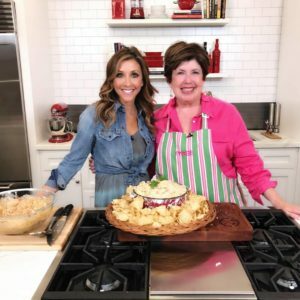 Here I am with the gorgeous host of Springer Mountain Farms “Chef’s Special” series, Christine Pullara. 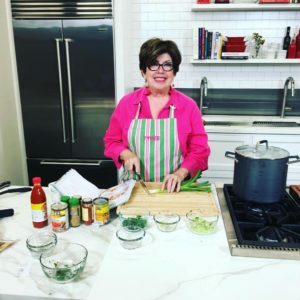 If you watch live you can ask me questions about my cookbook and my novels which I will answer in real time. If you miss the live broadcast, no worries. The video will live on Facebook forever. 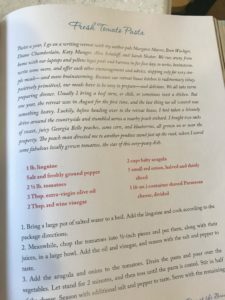 You can find the recipe in The Beach House Cookbook. If you don’t already have a copy, grab one now. Its most definitely not all summer food in there. 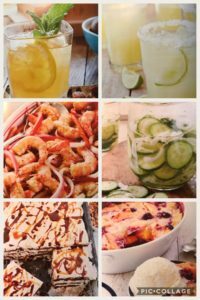 I’ve got easy breezy menu plans appropriate for every season and holiday, enough to last all throughout the year. Donate to Harvey Relief & Join Us For Drinks! Match our $250 donations to Americares! Six people will be our guests for drinks on Saturday. drinks & nibbles this Saturday evening in Decatur, GA! The three of us have made a donation of $250 apiece to the Americares HurricaneHarvey Relief Fund. If you are in the Atlanta-area and able to meet all three of us for drinks this Saturday night, we will choose the first six local donors who match our donations to join us for cocktails and nibbles at No. 246 this Saturday evening after the Decatur Book Festival. 2. Screen shot your confirmation screen or email. 3. 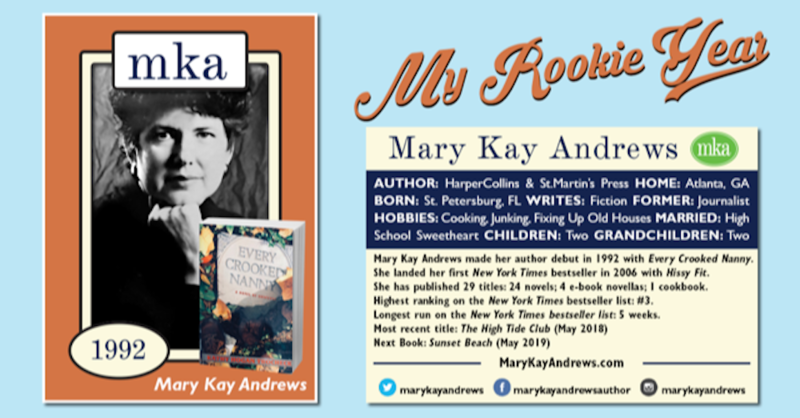 Email it to MaryKayAndrews@aol.com before midnight on Friday 9/1. We will notify the six winners with details on when/where to meet up with the three of us on Saturday evening. Not in the ATL this weekend, but still want to join the fun? Please consider giving. No amount is too small. Share with us in the comments your location and your words of love and hope for those suffering. We’ll raise a glass to all of you on Saturday night. 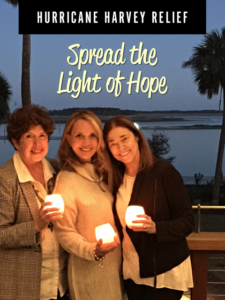 Will you join us in spreading the light of hope? For a fun & easy Easter Sunday brunch menu, try a few recipes from my upcoming The Beach House Cookbook. I demo’d a few of these recipes on Fox5 Atlanta’s Good Day Atlanta morning TV program on Thursday, April 13, 2017. 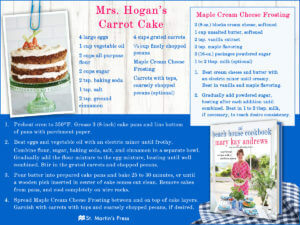 You can access all of these recipes in my new cookbook, which will be in stores on May 2nd. 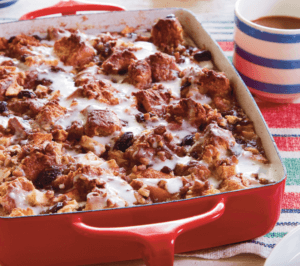 Meanwhile, here’s the recipe for the Cinnamon Roll Bread Pudding. Paired with Prosecco Sippers, Fruit Salad, and Pig Candy, it’s the perfect no-fuss, crowd-pleasing brunch menu. All can be made ahead and are easy to transport if you’re joining family & friends. Just put the casserole into the oven before church or the Easter egg hunt. 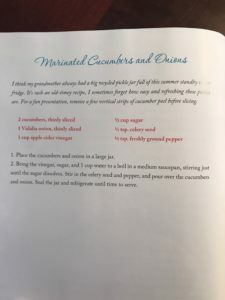 Two of Tom’s favorite grocery-store breakfast treats are cinnamon rolls—those big, gooey ones you buy on a foil tray in the bakery department—and apple fritters. So this is what you would get if an apple fritter were to marry a stale cinnamon roll. Not that a cinnamon roll was ever allowed to go stale in our house. But if that were to happen, you would have a heavenly culi­nary marriage—not to mention a very grateful audience around the breakfast table. 1. Preheat the oven to 350°F. Butter a 7-by-11-inch casserole dish. Combine the raisins and rum and let stand for 30 minutes. Drain, reserving 1 teaspoon of the rum. 2. Beat the half-and-half, brown sugar, milk, egg yolks, vanilla, cinnamon, nutmeg, and salt together in a large bowl until well combined. 3. Cut the cinnamon rolls into 1-inch chunks and add to the egg mixture, tossing well to coat. Stir in the apples, raisins, pecans, and reserved rum. Let stand for 30 minutes or until the bread has absorbed most of the liquid. 4. Spoon the mixture into the prepared baking dish, dot with the butter, and sprinkle with the cinnamon sugar. Place the baking dish in a roasting pan. Pour boiling water into the roasting pan to reach halfway up the sides of the dish. Bake for 50 to 55 minutes, or until the bread pudding is set and the top is browned. Carefully remove the bread pud­ ding from the water bath. 5. To make the icing, whisk the powdered sugar, milk, and rum in a small bowl until smooth. Drizzle the pudding with the icing and serve warm. My mother must have baked hundreds of these super-moist three-layer cakes with maple cream cheese frosting in her lifetime. It was a family favorite as well as the star of the dessert rotation at the restaurant she ran in downtown St. Petersburg, FL. She probably burned through a half-dozen food processors grating all those carrots. Get this and 90+ more recipes in THE BEACH HOUSE COOKBOOK, in stores May 2! 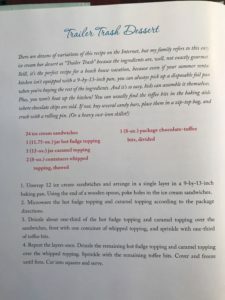 After mom passed away, my sister Susie inherited the carrot cake tradition. One Christmas, Susie and I baked the cake layers and left them cooling on the kitchen counter. When we turned around, we discovered that Wyatt, our English Setter, had devoured most of one of the layers. 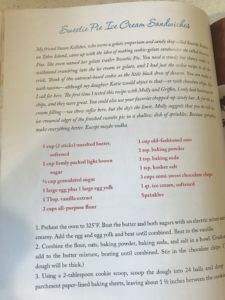 We mixed up anohter batch of batter, put it in the oven, and then realized we’d used up all the eggs we needed for another recipe. We set the timer and put my dad and Tom, who were watching football, in charge of removing the cakes. When we returned from the store, we were greeted with the distinctive aroma of burnt cake. Sure enough, their team had scored a couple touchdowns—but our cakes were ruined. Again. 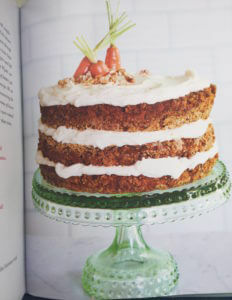 That was the year we discovered that two-layer carrot cake was better than none. If you attempt this creation for Easter, I hope your preparation is not as drama-fueled as ours was that fateful Chistmas! Happy Easter. Happy Spring. And happy baking! 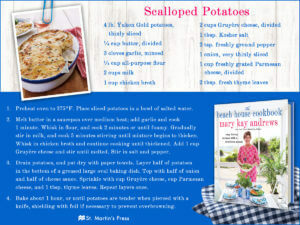 Scalloped Potatoes for St. Paddy’s Day! Who needs boring old boiled potatoes when you can drench your spuds in butter, coat them with cheese, and bake them to crispy, melty deliciousness? This dish–featured in THE BEACH HOUSE COOKBOOK (in stores May 2nd; pre-order now! 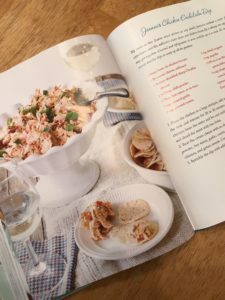 )–is such a crowd-pleaser that the last time I served it at a dinner party, my guests were sneaking back into the kitchen for second and third helpings. The richness of this recipe calls for really good cheese. I like the nuttiness of Gruyere, plus the saltiness of freshly grated Parmesan. None of that pre-grated stuff from the green can, please! Enjoy! And Happy St. Patrick’s Day one and all! 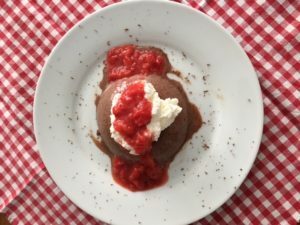 My recipe for Chocolate Panna Cotta with Strawberry Coulis is such a simple sweet treat to add to your Valentine’s Day supper. In fact, it’s featured on the “Valentine’s Day Sweetheart Dinner” menu in THE BEACH HOUSE COOKBOOK (coming May 2nd!). 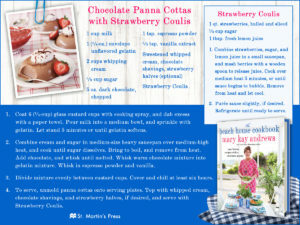 While it may sound like a very fancy-Nancy recipe, it’s really quite simple—sort of an Italian chocolate pudding make without the egg yolks, topped with a fast and delicious fresh strawberry sauce. Feel free to use any other berry that floats your gondola, though. I find those cute little glass custard cups at nearly every estate sale I go to, so I usually make my panna cotta in those,but it would also be pretty served in a wine glass or champagne coupes. Okay, let’s be honest, it would taste just as good if you just left it in the bowl you prepared it in and passed around long-handled spoons. But that doesn’t sound very romantic, now does it? 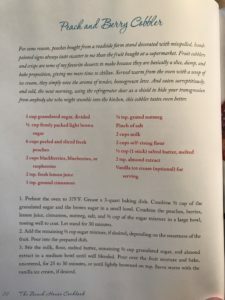 Here’s the recipe card. Enjoy!